This was one of the books that I bought at the Hull Central Library Book Sale a couple of months back. Been a busy few weeks but I finally have had the time to review it! I enjoyed this book immensely. I just want to say it from the outset. Normally my book reviews are written almost like a literary essay; they take a while to write because I dissect, and analyse, and evaluate. But this is one of those books which I was too busy enjoying, and a story with which I was too easily swept away to remember to earmark a page or make a note in my book review journal. So in fact this is may not be as detailed as my usual reviews, but this is for a very positive reason. I was too busy having a good time reading! 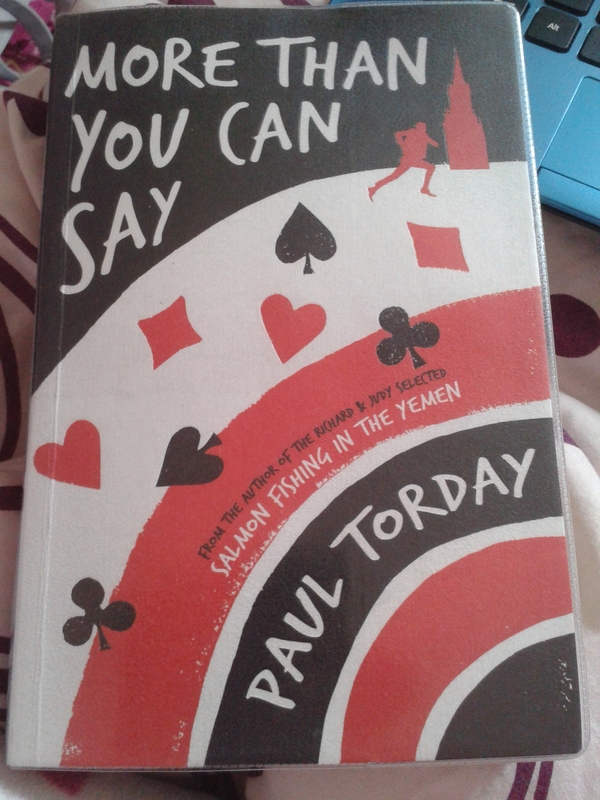 More Than You Can Say has it all: action, comedy, emotion, depth, interesting characters and a compelling plot. It plays with your emotions and makes you re-evaluate the big issues. It takes the important and sensitive subject of war, of PTSD and depression, and places it in a world and narrative that makes it easy enough to explore without it dragging you down. What I loved most about this book was how it shone a light on the traumas and difficulties that soldiers and army veterans face not only in the battlefield but in day-to-day life as well. I knew why people behaved like that. They were sick in the head. I was sick in the head. We had all seen things we should never have had to see, done things we should never have had to do. And all of us, when we came back from Iraq or Afghanistan, were constantly being reminded, every time we opened a newspaper or switched on the television, that we had done it for a cause the grateful public did not believe in any more, if they ever had. In the old days, it was ‘my country right or wrong’: when things happened that seemed to cross every boundary of human morality or decency you could always tell yourself, I suppose, that you were serving your country. But we had fought in wars that few people at home really cared about. No wonder some of us behaved badly. Perhaps what makes the main character, Richard Gaunt, so utterly compelling is that neither he or the author pretend that he is in any way perfect. He is innately likeable – he cares deeply about people, has a good sense of humour, and has a desire for justice and fairness. But he also has his flaws – he is aggressive, cynical, often subdued, lazy and unmotivated, and often does things without considering the consequences or indeed without much thought at all. But you get the feeling that he’s justified, sometimes, for the way he behaves. He’s been through horrific things and come out the other end alive, but can we really blame him for not emerging undamaged? This book taught me a lot about the war in Iraq, but also gave me a deeper understanding of its impact as it explores consequences much more complicated than cold hard facts and numbers. It explores Richard’s past and current relationships with people around him and how they are affected by the war. Take, for instance, his ex-fiancée, Emma. She is an attractive person, inside and out. She is loving and supportive, incredibly patient, and puts up with a lot from Richard. But even eventually she is driven away by his erratic and selfish behaviour, behaviour that Richard puts down to his horrific experiences in the army. He cannot function properly as a result of it and, by extension, neither can his relationships. It is not all doom-and-gloom, though, as Richard definitely matures throughout the book. After a while he comes to realise that he can no longer continue to use the war as a scapegoat or an excuse for the way his life has turned out. But in my heart I knew that I couldn’t just blame it all on the wars I had been in. I wasn’t even sure whether the fracture that had broken open deep within me was simply a consequence of the things I had seen; of the things I had heard; of the things I had done. When a stone shatters in the frost, is it because of the frost, or is it because the fault line was always there, deep inside the stone? It takes a long time and many amusing and not-so-amusing events for him to realise that he is still in control of what happens in his life, and that he doesn’t have to let the past dictate his present and his future. For this reason, the book ends on a note of hope. Things can get better, if only Richard wants them to. I would urge anyone who has been in the war, knows anyone who has been in a war, or anyone who hasn’t, to read this book. It’s funny, compelling, engaging, and thought-provoking. It’s full of fast-paced action and meaningful dialogue. It is both educational and entertaining, and is a true example of brilliant modern literature.